Attukal is a popular Hindu pilgrimage centre situated in the heart of Thiruvanathapuram in Kerala. Situated about two kilometres away from the famous Sree Padmanabhaswamy Temple, the place has made its name with the presence of the Attukal Bhagavathy Temple which is one of the ancient temples of South India. Popularly known as the Sabarimala of Women, the temple attracts women from all part of the country to come together and get the blessing from the Goddess in Attukal temple. The pilgrims who gather at Attukal temple would pay a visit to shrine of the supreme Mother Attukalamma. 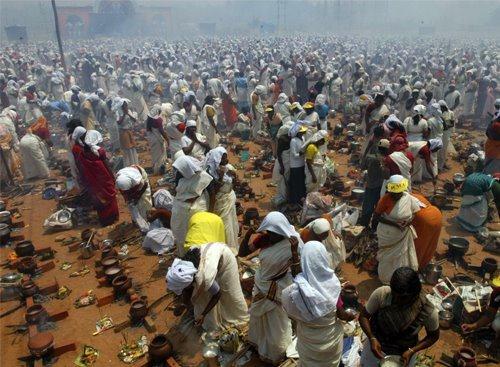 Every year millions of women gather for the annual Attukal Pongala Mahotsavam, a holy ceremony which is considered to be very special for each woman who prays to the Devi to get her blessings. In 2013 the Attukal Pongala(Ponkala) Festival which began on 18th February will witness the world famous Attukal Pongala which is scheduled for 26th February. The rituals which commences at 10.45 AM with the lightning of the Pongala Hearths will be followed by the sanctification of Pongala at 2.30 PM. The famous Chooral Kuthu ceremony with Kuthiyottam devotees joining the procession will be followed at 7.30 PM. The functions of the day will end with procession of the Goddess. On the final day, Akkathezhunallippu or re entering of the Goddess to the Temple will be performed. The festival will be concluded with Kuruthi Tharppanam. 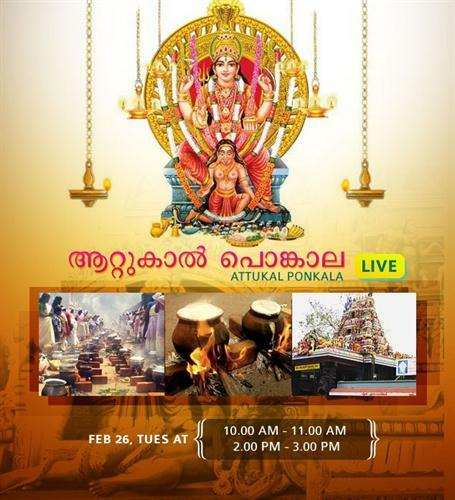 The most popular Attukal Pongala will be live telecast on all leading Malayalam Channels including Asianet News, Manorama News, Amrita TV, Mathrubhumi News, Indiavision, Reporter and People TV. According to mythology, Attukal Bhagavathy is considered to be an incarnation of Kannagi of Silapathikaram. Devi Kannagi, who has immense influence in the tradition and culture of Tamil Nadu and Kerala, do have four temples - three in Kerala and one in Batticalao in eastern Sri Lanka. As per the legend Kannagi, after putting Madurai to ashes, came to Chera Nadu, the present Kerala. During the journey, her feet touched the cold waters of the Kili in Trivandrum. Thus came the name Attukal, which originated from two words -Atturu – river and Kal – feet. The year 1997 witness the largest gathering with around 18 lakh women assembled in the temple. In 2013, the organisers hope that the number would touch 28 lakh which would break the earlier Guinness world record making it the largest congregation. Read about the history of Onam festival. Onam is the most favorite festival of Kerala. Onam is a festival of flowers. The festival Onam is celebrated on Malayalam month ‘chingam’, which is the first month in Malayalam calendar. All Keralitis are celebrating this festival with out any separation of cast and religion. The day, in which the ancient Kerala king, Mahabali, visit Kerala to see his people. Read about Onam celebration 2011 in Kerala. Onam is the harvest festival of Kerala. All Keralitis celebrates this Onam as their biggest festival. As part of this festival the peoples organized lot of celebrations and programs along this state. Details about Onam celebrations are given here. Read this article to know the items of a typical Onam sadya and also get the onam recipes of all the items. Onam is a very important festival for Keralites. It is a time for families and friends to meet each other. A very important factor of Onam is the grand feast that is kept in almost every Kerala home. Read this article to know all the details of the Onam dances.Onam is a very important festival of the state of Kerala in India. There are many traditional dances that are performed specially during this festival. The dances are Kummattikali, Kaikottikali, Puli Kali, Kathakali and Thumbi Thullal. Read this article to know more about Tripunithura Athachamayam 2011 Festival which is held at Tripunithura at Ernakulam district of Kerala state, India. The beginning of Onam festivals in Kerala are marked by these Athachamayam Festivals. In 2011, the famous Athachamayam festival is celebrated on 31 August. Here you will also get an idea regarding legends associated with Athachamayam festival of Kerala & the different art forms of it.